Thermaltake Pure Plus 12 Fan TT Premium Edition. 120mm high-static pressure fans with a 16.8 million colours LED ring and 9 addressable LEDs, the Pure Plus 12 RGB features compression blades and hydraulic bearings, controlled by the patented TT RGB PLUS Software and AI interactive voice control. 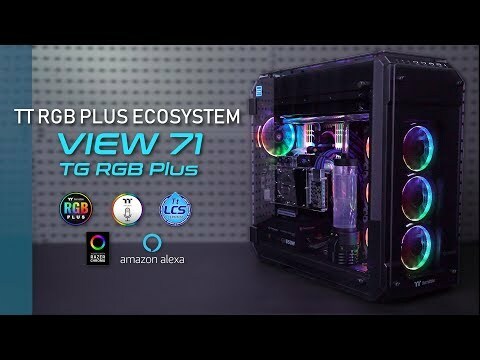 With wide top-to-bottom side ventilation grills, the View 21 TG RGB Plus edition maximizes airflow with four built-in 120mm Pure Plus 12 RGB fans. Including options for up to three 120mm or two 140mm front fans, combined with one bottom mount 120mm fan locations for maximum fan space selection and flexibility. Features • Supports ATX, MicroATX and Mini ITX Motherboards. • Tempered glass main and alternate side panels. • GPU length up to 410mm. • PSU length up to 220mm.